Objective To assess the efficacy of cognitive behaviour therapy delivered in primary care for treating irritable bowel syndrome. Setting 10 general practices in London. Participants 149 patients with moderate or severe irritable bowel syndrome resistant to the antispasmodic mebeverine. Interventions Cognitive behaviour therapy delivered by trained primary care nurses plus 270 mg mebeverine taken thrice daily compared with mebeverine treatment alone. Main outcome measures Primary measures were patients' scores on the irritable bowel syndrome symptom severity scale. Secondary measures were scores on the work and social adjustment scale and the hospital anxiety and depression scale. Results Of 334 referred patients, 72 were randomised to mebeverine plus cognitive behaviour therapy and 77 to mebeverine alone. Cognitive behaviour therapy had considerable initial benefit on symptom severity compared with mebeverine alone, with a mean reduction in score of 68 points (95% confidence interval 103 to 33), with the benefit persisting at three months and six months after therapy (mean reductions 71 points (109 to 32) and 11 points (20 to 3)) but not later. Cognitive behaviour therapy also showed significant benefit on the work and social adjustment scale that was still present 12 months after therapy (mean reduction 2.8 points (5.2 to 0.4)), but had an inconsistent effect on the hospital anxiety and depression scale. 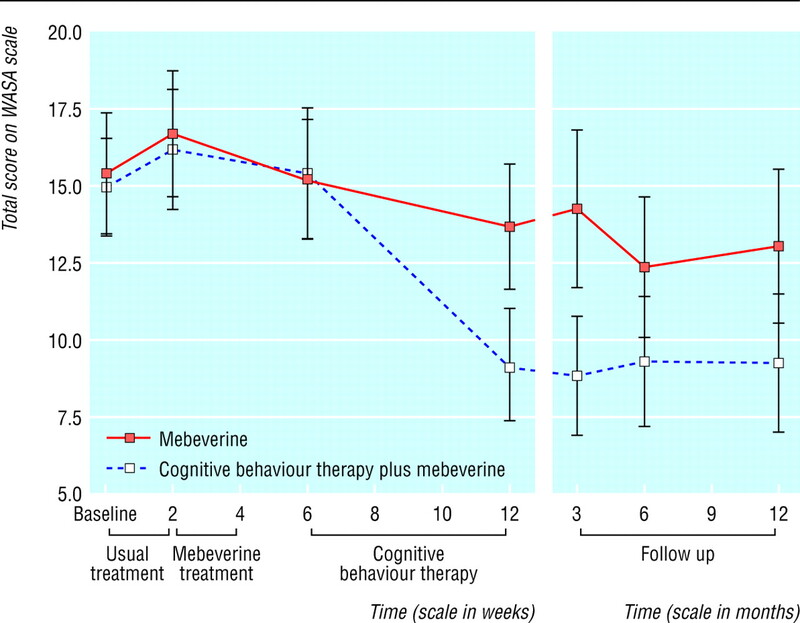 Conclusion Cognitive behaviour therapy delivered by primary care nurses offered additional benefit over mebeverine alone up to six months, although the effect had waned by 12 months. Such therapy may be useful for certain patients with irritable bowel syndrome in primary care. Irritable bowel syndrome is a common, chronic, non-inflammatory condition affecting up to 20% of the general population. It is characterised by abdominal pain, altered bowel habit (diarrhoea or constipation), and abdominal bloating, and the structural or biochemical aetiology is not agreed.1 It accounts for considerable morbidity but not mortality2 and represents a substantial burden on health services. It is diagnosed on the basis of symptoms,3–5 and treatment is directed at symptom control. Patients find their doctor's explanation and advice to be particularly helpful.11 Apart from hypnotherapy,12 no psychological treatment has been shown to confer exceptional advantage. A controversial meta-analysis supported the use of smooth muscle relaxants, including mebeverine.13 Cognitive behaviour therapy has been found to be effective in hospital patients with irritable bowel syndrome, but more recent trials have reported equivocal results.14 15 Such therapy is not widely available, however, and has not been evaluated in primary care. We therefore investigated whether cognitive behaviour therapy is of benefit to primary care patients with troublesome irritable bowel syndrome. Such therapy would probably be reserved for patients in whom conventional treatment had failed, so we tested it with patients who had already received usual primary care and a trial of mebeverine. To improve the availability of cognitive behaviour therapy we trained general practice nurses to deliver the therapy under the close supervision of an experienced therapist. Our a priori hypothesis was that cognitive behaviour therapy would show benefits over six months after treatment finished but that the effects would begin to wane by one year after treatment, in common with other psychological and physical treatments for irritable bowel syndrome. Patients attending 10 general practices in central and south London who were aged 16-50 years and had a clinical diagnosis of irritable bowel syndrome were invited to participate in our study by their general practitioners, who provided them with an information sheet. A study nurse saw potential participants within two weeks. The patients completed questionnaires covering baseline assessment, exclusion criteria, and the Rome I diagnostic criteria.4 We excluded patients who were pregnant or breast feeding; had alarm symptoms suggestive of colorectal cancer (such as unexplained weight loss or rectal bleeding); had a past or present disease that would complicate study evaluation (such as inflammatory bowel disease or coeliac disease); had abdominal pain relieved by acid inhibiting drugs; or were unable to fill in the written questionnaire. Eligible patients were asked to give written consent. Patients had a full blood count and an erythrocyte sedimentation rate if the tests had not been done in the previous 12 months. We forwarded the test results to the patients' general practitioner, and other investigations and referrals were conducted at the doctor's discretion. If patients had a personal or family history of colorectal cancer in a first or second degree relative they were referred back to their general practitioner for an opinion and retained in the study if the doctor considered that there was no reason for concern. After patients had had usual treatment from their doctor for two weeks, they were reassessed, and those whose irritable symptoms were still moderate or severe (see below for scoring system) were offered mebeverine 275 mg three times a day for two weeks. After four weeks, the study nurse reassessed the patients, and those who continued to have moderate or severe symptoms were randomised to receive mebeverine alone or mebeverine plus cognitive behaviour therapy. Patients were assessed again at six weeks after randomisation or on discharge from nurse therapy, and at three, six, and 12 months after treatment had finished. Patients were randomised into the two treatment groups by means of random numbers derived in blocks of four from random number tables. A statistician unconnected to the study generated the randomisation, kept a copy of the randomisation codes, and provided a copy to a clerical member of the departmental staff not involved in the study. Given the expected numbers recruited, no stratification variables were used for the randomisation. Written informed consent was obtained from each subject before randomisation, and patients were allocated to treatment if they were eligible on completion of their third set of assessment instruments. The clerical staff member maintained a record of the allocations, and planned allocations were checked against actual treatments received at the end of the study. Allocation concealment was not adequately maintained on every occasion, and in some cases the nurse who would provide cognitive behaviour therapy was aware of the planned allocation. Four general practice nurses were recruited and trained to deliver cognitive behaviour therapy as described in a manual written for the study by SD; their training occupied one day a week for 12 weeks.16 Therapy consisted of six 50 minute sessions at weekly intervals of face to face contact and was based on Lang's three systems model (which explains how cognitive, behavioural, and emotional or physiological responses are linked and how changes in one system may cause a change in another).17 Therapy included education about the nature of irritable bowel syndrome, behavioural techniques aimed at improving bowel habits, cognitive techniques to address unhelpful thoughts related to the syndrome, and techniques to reduce symptom focusing, manage stress, and prevent relapse. For supervisory purposes, all therapy sessions were recorded. Both treatment groups continued to take 270 mg of mebeverine three times daily. The main outcome measure was patients' scores on a symptom severity scale specific for irritable bowel syndrome.18 This includes an assessment of the impact of symptoms on general wellbeing (global impact). With a maximum score of 500, patients' symptoms may be scored as mild (score 75-174), moderate (175-299), or severe (300-500). Scores of < 75 indicate normal bowel function. Subsidiary outcome measures were scores on the hospital anxiety and depression scale19 and the work and social adjustment scale.20 The former is a measure of psychopathology, with subscales for anxiety and depression, and the higher the score (up to 21 on each subscale) the more severe the disorder. The work and social adjustment scale measures handicap affecting the ability to work, to manage the home, and to participate in social and private leisure activities and relationships. Each aspect is scored from 0 (not affected at all) to 8 (severely affected), with a maximum total score of 40. Assessments were repeated at each follow-up, principally by postal questionnaires. An a priori power calculation assumed that the mean score on the irritable bowel symptom severity scale at six months' follow-up would be 133 (mild) (SD 80) in the cognitive behaviour therapy plus mebeverine group and 180 (moderate) (SD 80) in the control group. This indicated that 62 patients would be needed in each group to give the study 90% power with 95% confidence. Allowing for drop outs, we estimated that we required 240 patients. We analysed the data using SPSS and Stata. We dealt with missing data items, not by carrying forward the previous value, but by imputing a score based on changes in other items, when at least 75% of those items were present (such as irritable bowel symptom severity scale). We conducted a regression analysis based on intention to treat, using generalised estimating equations on follow-up assessments. It was a completely saturated model that included analysis of interaction between treatment and follow-up assessment and that fitted the average of all baseline measures as a covariate (that is, separate estimates at each time point for each treatment arm).21 There were robust standard errors for repeated measurements.22 In each regression the effect of treatment with cognitive behaviour therapy is given as an estimated difference between the means of the scores for the two treatment groups. The estimated treatment effects at the four visits were averaged to give a summary estimate of effect over one year. Figure 1 shows the patient flow through the study. Over 27 months, 334 patients were referred from the 10 general practices, which had a total registered population of about 45 000 patients. Among the 235 apparently eligible patients who agreed to participate, there were eight protocol violations, when patients above the study age limit were recruited—five allocated to cognitive behaviour therapy plus mebeverine and three to mebeverine only. The oldest patient was aged 54, six were 51 (one of whom dropped out after the second assessment), and one was 52. Two hundred and nineteen patients attended the second assessment, when a two week supply of mebeverine 275 mg three times a day was prescribed for 193. At the third assessment 149 patients with irritable bowel syndrome of sufficient severity remained in the trial and were randomised to cognitive behaviour therapy plus mebeverine (n = 72) or mebeverine alone (n = 77). The mean age of the 235 patients who agreed to participate was 33.8 years (SD 8.6); most of whom were women (82%) and white British (65%). Of these, 113 (48%) had had a diagnosis of irritable bowel syndrome for more than five years, 61 (26%) had tried alternative or complementary therapy, 102 (43%) had consulted their doctor about a psychological problem in the previous five years, and 199 (85%) fulfilled the Rome I diagnostic criteria for irritable bowel syndrome. The severity of irritable bowel symptoms varied, with five patients (2%) reporting normal bowel function, 19 (8%) having mild symptoms, 89 (38%) with moderate symptoms, and 122 (52%) with severe symptoms. Table 1 shows the patients' baseline scores. Irritable bowel syndrome is a clinical diagnosis. We examined the general practice records of 213 patients (we did not examine records of patients who had moved practice or who withdrew from the study). General practitioners had diagnosed irritable bowel syndrome without specialist referral in 149 of these patients and had referred 64 to a gastroenterologist before diagnosis. Most of the patients diagnosed in primary care (85%) met the Rome I criteria, as did 88% of patients seen by a gastroenterologist. Blood counts were available for 208 patients: two had reduced haemoglobin concentrations (< 115 g/l), one of whom had a pre-study diagnosis of an autoimmune disorder (not inflammatory bowel disease), and the other had no cause identified. Of the 207 patients whose erythrocyte sedimentation rates were measured, 12 had raised results. One patient had pulmonary tuberculosis, three had autoimmune disorders (not inflammatory bowel disease), three had undergone extensive gastrointestinal investigation with normal results, and five did not have a satisfactory explanation for their results. The patients' general practitioners were informed of the results. Six patients received seven sessions of cognitive behaviour therapy (having asked the nurse for an extra session because they found them helpful), and fewer than half of patients were considered by the therapist to have completed therapy, with 41% either declining therapy or dropping out for other reasons (table 2). The commonest reasons given for non-attendance were that the patient had been unable to get time from work or from home commitments such as child care. 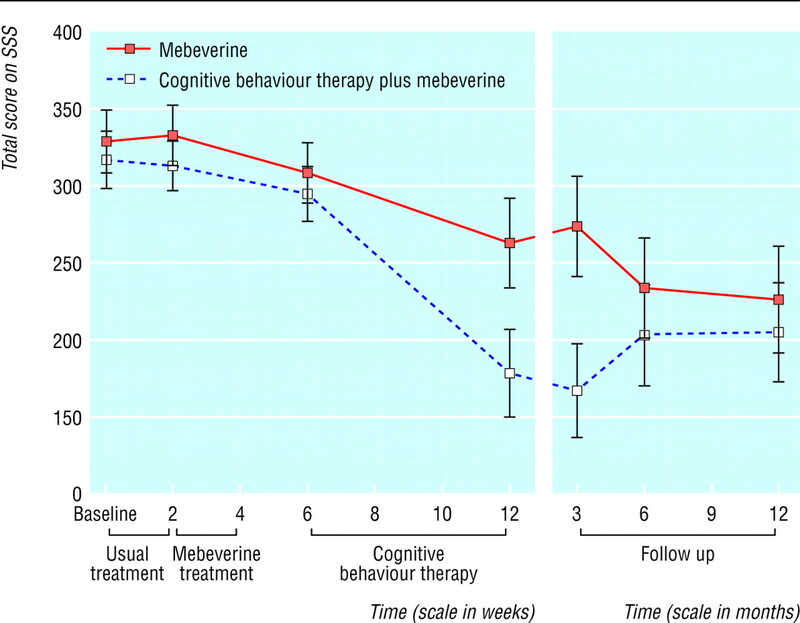 Figure 2 shows that the addition of cognitive behaviour therapy to mebeverine treatment had a beneficial summary effect over one year on the symptom severity scale, reducing the total score by 37 points (95% confidence interval 8 to 67, P = 0.01). Therapy had a similar beneficial summary effect on the syndrome's global impact (question 4 on the symptom severity scale), reducing the score over the year by 14.4 points (8 to 21, P = 0.001). Table 3 shows the treatment effects using the parameter estimates from the statistical model at each follow-up for both the total symptom severity score and the global impact question. These show that the benefits from cognitive behaviour therapy declined over time, with neither measure showing a significant effect by 12 months after therapy. The small number of patients receiving three or fewer cognitive behaviour therapy sessions precluded separate analysis of outcomes in this subgroup. The symptom severity scale allows banding of bowel symptoms from “normal” through “mild” and “moderate” to “severe,” which clinicians may find more helpful than actual scores. The summary odds ratio for the effect of cognitive behaviour therapy over one year for having “severe” symptoms was 0.43 (95% confidence interval 0.30 to 0.62, P < 0.001). Table 3 shows the odds ratios for each follow-up assessment. We observed no significant harms in this study. The number needed to treat to change one patient's “severe” symptoms to “normal” at three months in the cognitive behaviour therapy group was 5.9 (3.3 to 27.8). Figure 3 shows the mean scores on the work and social adjustment scale for the treatment groups over time. The summary effect of cognitive behaviour therapy over one year was to reduce the score by 3.4 (1.5 to 5.3, P < 0.001). Although the effect declined over time, disability was still reduced 12 months after treatment (table 3). For the hospital anxiety and depression scale, the summary effect of cognitive behaviour therapy over one year was to reduce the score by 2.0 (0.5 to 3.5, P = 0.009). The effects at each follow-up were variable, with scores reduced by 1.5 (0.5 to 3.5, P = 0.1) at six weeks, by 3.3 (1.1 to 5.4, P = 0.003) at three months, by 0.6 (−1.5 to 2.7, P = 0.6) at six months, and by 2.7 (0.6 to 4.8, P = 0.01) at 12 months after therapy. This study is the first to report on the use of cognitive behaviour therapy for irritable bowel syndrome in primary care, and to show that the therapy improved patient outcomes when added to drug therapy. Limitations of this study include the absence of a control for cognitive behaviour therapy and the failure to ensure allocation concealment from the nurses giving the therapy. However, it is difficult to control for cognitive behaviour therapy, and we thought it important to investigate whether cognitive behaviour therapy offers added benefit when combined with drug treatment. The patients had a clinical diagnosis of irritable bowel syndrome, and although most of the patients were diagnosed without referral to a specialist, the Rome I criteria were met by equal proportions of patients whether diagnosed by their general practitioner alone or after referral. We trained selected general practice nurses to deliver cognitive behaviour therapy in general practice under close supervision. For practical reasons, the nurses were part of the research team and not integral to the healthcare teams where they operated, so that our degree of control over the quality of the therapy delivered was probably greater than that which could be expected in routine practice. Although it was not a trial objective to assess how skilled the nurses became, it may be that a modular training programme like ours (lasting 12 days in all) could increase access to cognitive behaviour therapy by training non-specialist nurses. The beneficial effect of providing up to six sessions of cognitive behaviour therapy in addition to drug treatment was detectable up to six months after therapy, both in terms of symptom relief and of improvement in social and work disability. We were, however, unable to determine whether shorter courses of therapy might have been as effective. Although we think our results show a clinically useful effect, research is clearly required to determine whether patients might benefit from “booster” therapy sessions to maintain their initial improvement. Cognitive behaviour therapy has been shown to reduce relapse in depression, and may do likewise in irritable bowel syndrome. In this study, the therapy did not have a consistent effect on mood as measured by the hospital anxiety and depression scale but had a reasonable influence over 12 months on disability (work and social adjustment scale). These results pose questions as to what constitutes a beneficial outcome. Published trials in irritable bowel syndrome have rarely included patients from primary care, and follow-up periods have generally been short. Existing drug treatments for irritable bowel syndrome are inexpensive, but new ones may not be. In addition, drugs such as tricyclic antidepressants can have adverse effects, as can tegaserod, a drug for constipation-predominant irritable bowel syndrome,23 and alosetron,24 designed for diarrhoea-predominant irritable bowel syndrome and which has not been released in the United Kingdom because of safety concerns. Benefits may wear off rapidly after patients stop taking these drugs, which are designed to treat particular symptoms of the irritable bowel syndrome or patient subgroups. Patient entry into our study was unrestricted, so our patients represented all subgroups of irritable bowel syndrome; we did not identify any adverse events, and both treatment arms were well received by patients. Further controlled evaluations of drug and non-drug therapies, alone and in combination, and studies to identify the characteristics of patients likely to benefit from different treatments are needed to define the optimum treatment strategies for irritable bowel syndrome, particularly in relation to the benefits and harms of new treatments. We thank study nurses—Rebecca Holt, Tricia Lewis, Sheila Morton, and Lindsey Shephard—for their contribution, and we thank the patients, doctors, and staff at the participating general practices. Statistical advice in the early stages of the study was provided by Sophia Rabe-Hesketh. Contributors TK,RJ, SW, and TC had the initial idea for the study and wrote the research grant application. SD trained the nurses and acted as the trial research coordinator. PS provided statistical advice. TK, TC, and RJ wrote the early drafts of the manuscript, to which all authors contributed. RJ is guarantor for the study. Funding This study was funded by a grant from the NHS Health Technology Assessment Programme. Competing interests RJ has acted as a consultant for pharmaceutical companies Novartis, Boots, and Solvay. TK has acted as a consultant for Boots. Ethical approval Approval was received from St Thomas' Hospital Research Ethics Committee, Guy's Hospital Research Ethics Committee, and Barnet, Enfield and Haringey LREC.
. Irritable bowel syndrome: a little understood organic bowel disease? Lancet 2002; 360; 55564.
. The irritable bowel syndrome: long term prognosis and the physician-patient interaction. Ann Intern Med 1995; 122: 10712.
. Towards a positive diagnosis of the irritable bowel. BMJ 1978; ii: 6534.
. Irritable bowel syndrome: guidelines for diagnosis. Gastroenterol Int 1989; 2: 925.
. Identification of sub-groups of functional gastrointestinal disorders. Gastroenterol Int 1990; 3: 15972.
. Irritable bowel syndrome, gastro-oesophageal reflux and bronchial hyper-responsiveness in the general population. Gut 1998; 43: 7704.
. Reasons for consultation in irritable bowel syndrome; symptoms and patient characteristics. Br J Gen Pract 1992; 42: 45961.
. Organic and functional disorders in 2000 gastroenterology outpatients. Lancet 1983; i: 6324.
. Epidemiology of cholecystectomy and irritable bowel syndrome in a UK population. Br J Surg 2000; 87: 165863.
. The epidemiology of hysterectomy and irritable bowel syndrome in a UK population. Int J Clin Pract 2000; 54: 64750.
. Doctor-dependant changes in complaint-related cognitions and anxiety during medical consultations in functional abdominal complaints. Psychol Med 1995; 25: 10118.
. Hypnotherapy in severe irritable bowel syndrome. Further experience. Gut 1987; 28: 4235.
. Meta-analysis of smooth muscle relaxants in the treatment of irritable bowel syndrome. Aliment Pharmacol Ther 2001; 15: 35561.
. Cognitive-behavioral therapy versus education and desipramine versus placebo for moderate to severe functional bowel disorders. Gastroenterology 2003; 125: 1931.
. A randomised controlled trial of cognitive behaviour therapy, relaxation training and routine clinical care for the irritable bowel syndrome. Am J Gastroenterol 2003; 98; 220918.
. Cognitive behaviour therapy versus antispasmodic therapy for irritable bowel syndrome in primary care. Health Technology Assessment. London: Department of Health (in press).
. A psychophysiological analysis of fear modification using an automated desensitization procedure. J Abnorm Psychol 1970; 76: 22034.
. The irritable bowel severity scoring system: a simple method of monitoring irritable bowel syndrome and its progress. Aliment Pharmacol Ther 1997; 11: 395402.
. The hospital anxiety depression scale. Acta Psychiatr Scand 1993; 67: 36170.
. Behavioural psychotherapy: Maudsley pocket book of clinical management. Bristol: Wright, 1986.
. Repeated measures in clinical trials: analysis using mean summary statistics and its implication for design. Stat Med 1992; 11: 1685704.
. On the variances of asymptotically normal estimators from complex surveys. Int Stat Rev 1983; 51: 27992.
. Tegaserod, a 5-HT(4) receptor partial agonist, relieves symptoms in irritable bowel syndrome patients with abdominal pain, bloating and constipation. Aliment Pharmacol Ther 2001; 15: 165566.
. Alosetron relieves pain and improves bowel function compared with mebeverine in femal nonconstipated irritable bowel syndrome patients. Aliment Pharmacol Ther 1999; 13: 141920.